It is with great sadness that we announce the sudden passing of Russell Lance Red Crow (Iipama’nihkii - Singing Across), 41, at his home on the Blood Reserve on April 10, 2019. A lifelong resident of the Blood Reserve. He was born on Easter Sunday March 26, 1978 to the late Melvin Red Crow and the late Bernice Red Crow. Aunties Rosaline, Virginia, Phyllis, Nina (Lee), Deanna (Ed), Velma (Gilbert), Laura (Jim), Laurette (Ken) and Kathy; Uncles Larry, Barry (Lorraine) and Jerry (Joanne). He is predeceased by his parents Melvin, Bernice Red Crow and his step father John Red Crow; niece Nicole Red Crow; Maternal grandparents Rosaline and Lawrence Black Plume; uncles Francis and Randall, Adolph Black Plume; Aunty Lena Black Plume. Russell was a friendly outgoing person, and everywhere he went he gained many lifelong friendships. His boisterous laugh, silly sense of humour and his infectious personality led him to be successful in his endeavours throughout his life. He was a caring person towards family and friends especially towards his dear mother whom he cared for until her passing. Russell worked with numerous organizations such as the Blood Tribe Youth Ranch, Treaty 7 Aboriginal Futures, Kainai Correction Centre, and Head Smashed In Buffalo Jump. He was a well- known Master of Ceremonies at numerous Pow Wows, Rodeos, Indian Horse Relays, Weddings, Anniversaries, Graduations and hockey events. He announced at Kamloopa, Emerald Downs, Skopabsh Celebration Muckleshoot, Auburn USA, Clearwaters Casino Pow Wow, Idaho USA, IRCA Rodeos, and for the Kainai Braves Hockey games to name a few. He was an avid golfer and a goalie which earned him the name “Redlight.” #1 dedicated oilers fan. 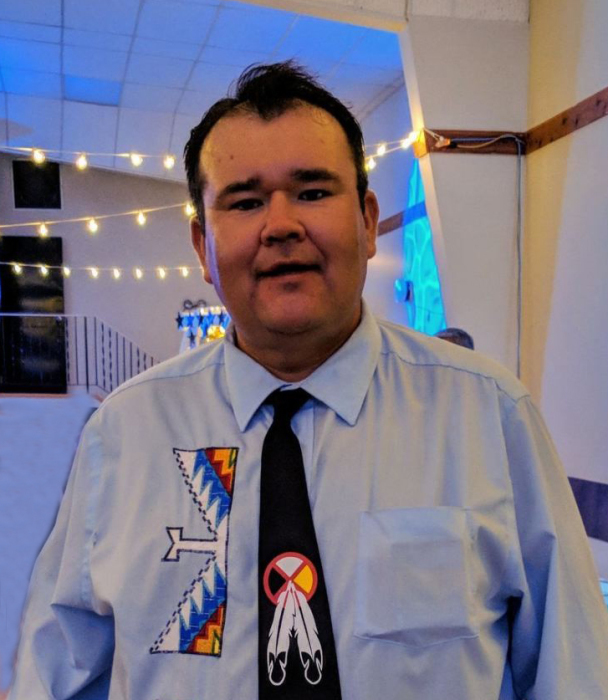 Russell’s greatest and proudest talent was his beautiful voice he loved to sing pow wow and country songs for his family and especially to his friends. He will be deeply missed by family, friends and all who knew him. A Wake Service will be held at 7:00pm, on Tuesday, April 23, 2019 at MARTIN BROTHERS RIVERVIEW CHAPEL, 610-4 Street South, Lethbridge, Alberta. A Funeral Service will be held at 11:00am on Wednesday, April 24, 2019 at ST. MARTHA’S CATHOLIC CHURCH, 355 Columbia Blvd West, Lethbridge, Alberta. Interment Service to follow at the Prairie Rose Family Cemetery. There's still time to send flowers to the Wake at the Martin Brothers Riverview Chapel at 7:00 PM on April 23, 2019.